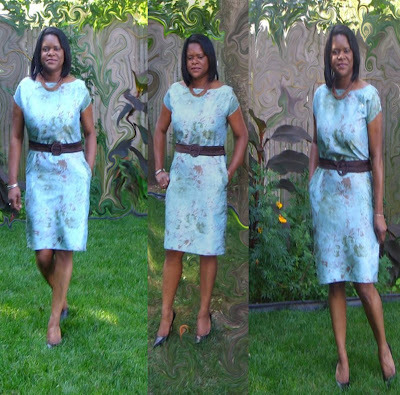 Butterick 5211- MISSES’ DRESS AND BELT: Dresses A, B, C have back neck opening with button and thread loop closure, extended shoulders and topstitching detail. A: front upper and lower sections. B: self-belt. C: gathered sleeve with elastic casing, length 2" above mid-knee. Did it look like the photo/drawing on the pattern envelope once you were done sewing with it? Very much so. What did you particularly like or dislike about the pattern? I have been on a shift dress kick and wanted to try another one and the neckline and pocket detail hooked me in. Would you sew it again? Would you recommend it to others? I doubt I will sew this again, but would recommend it. You always manage to pick the cutest fabric for your dresses! This one is no exception...very cute dress! Very cute, looks great on you. Nice Dress. Love the fabric. Lol@the comment on the depth of the pockets. The belt is a nice touch. Great color combo!! Very smart looking dress. I love your fabric choice. Nice!!! Another great dress! Looks good on you too! Love the dress! I've not seen this pattern. It truly is a nice dress and I love the fabric. Time to go Bra shopping.